Moving time: 5 hr 32 min. Wind: South wind all day long. It started out at 5 mph but grew to 15 mph by the end of the ride at 4:00pm. Weather: 75°F (24°C) in the morning; got up to 92°F (33°C) by the end of the ride at 4:00 pm. Just like yesterday but slightly more clear. I rode with Joe and Geert again today. There are some significant advantages to riding in a group. 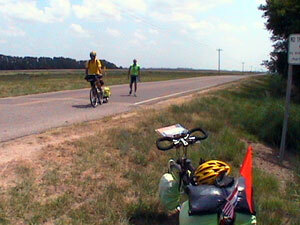 There is a great deal of inherent commonality and comeraderie among long distance cyclists. We feed off the experience of others and provide a great deal of support for each other. For instance, Geert broke a spoke yesterday and blew a tire today. We were there for him and I'm sure that he would be there for us if we had a problem. 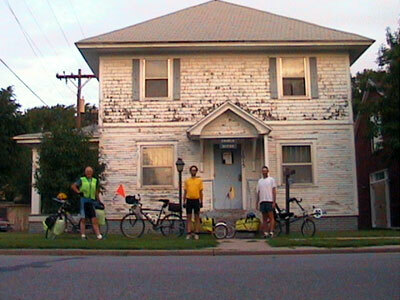 The picture to the right is of us in front of the Zion Church bike hostel in Hutchinson before we left this morning. It is a good thing that I met up with these guys when I did. Yesterday and today we did some very long stretches with no services. There was a 46 mile stretch today where we passed nothing but fields. It's really rough having no services for such a distance and there were very few trees to provide shade from the hot sun. Knowing that there are two other guys going through the same thing is reassuring and comforting. We have been riding at a slower pace than I did before I met up with them. I thing it is much better to ride a little more slowly since it leaves me refreshed at the end of the day. I had my first mechanical problem today. My left pedal has a bolt that holds the release assembly for the cleats. Well... it came loose today and just about fell out. Luckily there is a matching assembly on the other side of the pedal so I'm not out of luck. I got it all put back together but broke the head off the bolt. I'll avoid using that side of the pedal and will have it looked at in Pueblo when I reach their bike shop. Perhaps I'll have some pedals sent to me or I'll buy a new set. Yesterday I almost bought a new helmet with a visor on it. Today I wished that I had. The sun is very hot and beats down on my face. Most other riders have visors on their helmets that seem to make a great deal of difference. Early in the trip we passed a bed and breakfast that is also an exotic animal ranch where they keep ostrich, zebra, and camel. The views are the same as yesterday. It's very flat here. Very flat. Last spring I flew to Las Vegas and to San Francisco from Pennsylvania. During those trips I made sure to pay attention to the terrain below. The great plains looked so bleak - they are. The roads are perfectly straight and they have a grid of gravel roads spaced exaclty one mile apart. From overhead it must make the landscape look like a gigantic chess board with tens of thousands of spaces. 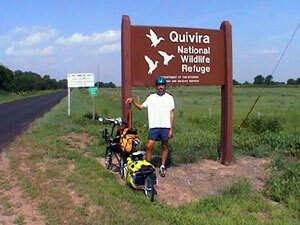 We also rode through the Quivira National Wildlife Refuge which contains a huge salt marsh and is home to dozens of species of birds. We saw many, many unique varities of feathered friends. Oil wells continue to dot the fields. They give off a sweet, oily odor that is very distinct. I never imagined that there would be so many wells out here but I have recently learned that the great plains hold a tremendous amount of oil. There are other scents that are very unique and they alternate as I ride along. 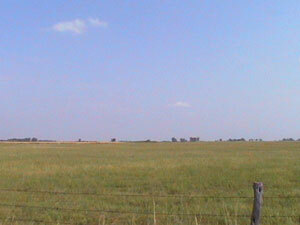 Freshly cut hay, sunflowers, wildflowers, and feed lots fill the landscape. The cattle feed lots don't smell so great, though. The greatest part of riding in Western Kansas is the elevation gain we achieve. Unlike the rollercoaster hills of the Appalachians and Ozarks, the grades here are gradual and there is a pretty good net rise for the day. We gained about 600 feet of elevation and never felt it. The land rises very gradually to the foothills of the Rocky Mountains. We almost pushed on to the next town which is 34 miles ahead but decided to stop since this town has good services, hotels, and the sun was beating us down. Riding in Kansas is very easy with no hills and a slightly annoying crosswind. The wind is nearly always from the due south and it blows very consistently. Here is another picture of Joe and Geert. The people here are absolutely wonderful. I think they respect what we are doing and realize the severity of the hardship we are going through. Kansans go out of their way to help out with whatever is necessary. 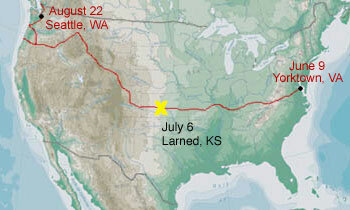 Fort Larned is just seven miles west of here and we'll ride past it tomorrow. The fort served as a very important defensive post along the Santa Fe trail during the nineteenth century.